Primary Election Just Days Away! We have just 10 days before the Primary Elections take place in Idaho. Gun grabbers are pushing hard to get candidates elected who will “work with” Michael Bloomberg and Moms Demand Action. That includes candidates who are Democrat and Republican! We need your help for one last Primary campaign push — more on that in a second. The last few months have been intense. Campaigns across Idaho have been battling to win your votes. The reality is we have seen this every election cycle. Candidates go on the campaign trail with their staged photos, and stories about how they grew up hunting, so you must trust that they believe in the 2nd Amendment. Is that good enough for you as a voter? You see, Bloomberg and some weak-kneed Republicans have figured out that in Idaho, all you have to do is say you believe in the 2nd Amendment and hope that will get you elected. Then, after they are safely in office, they can put no effort into passing solid pro-gun legislation. And worse, they vote for watered-down legislation and come back to you in two years to ask for your vote once more. And perhaps, they can vote for gun control and hope you never saw their vote. Just this last session we saw dozens of Idaho’s legislators, both Republican and Democrat, vote in favor of gun control in House Bill 585. They are duping voters, and some gun owners, into supporting these gun confiscation laws all across the country. And that’s the importance of the candidate survey program that we do each election cycle. It’s a starting point in your research of District candidates on where they stand on specific issues that the ISAA is looking to fight for, or against. You can see how your candidates responded, if they did at all, by clicking the link here. At the end of the day, you have to dig in much deeper into your candidates than just listening to their campaign rhetoric. Find your candidates and ask them specific questions, face to face. 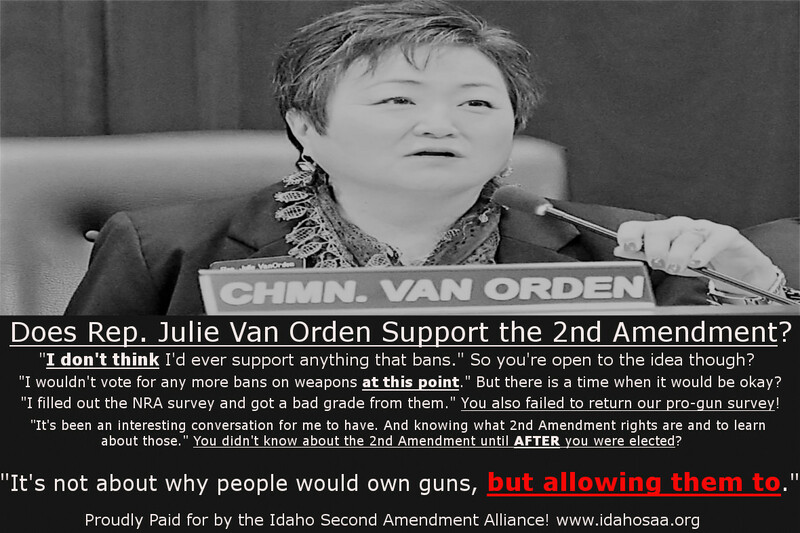 In fact, recently at a candidate forum in District 31, Rep. Julie Van Orden made some very disturbing remarks when asked about 2nd Amendment issues. You can see them in the image below. That’s a Republican Representative in Idaho! The government allows us to own guns? No ma’am, that’s not how this works. That kind of rhetoric is something you would hear from Michael Bloomberg and Hillary Clinton, not an elected official in Idaho. And Rep. Van Orden’s comments are just one of many issues that we are using to inform voters about where candidates stand on the 2nd Amendment. That’s why we need your help right away! We need your help to expose those who don’t want to stand up and fight for the 2nd Amendment. >>> First, please send in your most generous contribution right away of $200, $100, or even just $75 to help us boost more campaign ads into key legislative districts! If that’s simply too much right now, then even a smaller donation of $50 or $25 may make the difference between informing hundreds or thousands of voters on where candidates stand on gun rights. >>> Second, make sure you know where your own candidates stand on 2nd Amendment issues by checking out the survey results here. >>> Finally, please make sure to follow our Facebook page for last minute updates and key pieces of legislative information. With Bloomberg and his minions switching parties to try and take out Constitutional candidates, it’s time for you to step up and get ready for this key election. Real Stand-Your-Ground still doesn’t exist in Idaho and this election may be the difference between passage in 2019 or failure. The choices are before you. ISAA Legislative Survey Results Are In!